In a What Is To Be Done? protest reality, let us take a look at two different perspectives which highlight issues that need to be addressed, but do not offer a definitive means for accomplishing either, except by way of expecting some legislative miracle via the same pathetic political environment to take place like the old "catch-22" idea. It's not that the perspectives are wrong, but they offer no respite from a continuation of the same government which adamantly refuses to help the people. Who and/or what is the obstacle and how do we remove it, if the current system of government is a major part of the problem? How do we resolve this if we will not engage in a direct confrontational approach not only against the government, but corporations and religious entities? So, how do we get the Pentagon and Corporations to change if the present system of government protects them and all our protests amount to little more than some exposition on Youtube that only a handful of people may watch and out of that handful only a marginal few agree to the point of sharing, and out of their viewers only a very small percentage are ready to take up actual arms against the American Evil Empire whose system of government is a 1% form of democracy, a 2% form of Socialism and a 97% formula of plutocracy, corporatocracy, fascism, idiot-ology, and the like? Figuratively speaking... the man "tore his Representative apart", but unfortunately, this only figuratively results in an emotional relase of pent-up emotions which finally become articulated in a time and place under conditions which result in little more than this, and does not appreciably resolve the problems he spoke of and many of us agree with. We need to move beyond the "figurative" into the realm of being definitive. We need to move past the tears, the anger, the conflicts between patriotism, a parsimonious respect for the law and the greater rights all of us are duly entitled to. Make no bones about it... (as the old saying goes), we are on the path of a very bloody Revolution. It is a growing acceptance to which it has become recognized by the government and is using the placement of soldiers at the border agains the Caravan peoples as a means to acquire some civilian protest crowd control knowledge. In other words, the government well knows that a Revolution is in the making and are making preparations to confront it instead of giving in to the collective opinion of the public. "According to the Economic Policy Institute, the top 1% of wage earners saw their incomes increase by more than 153% between 1979 and 2012. 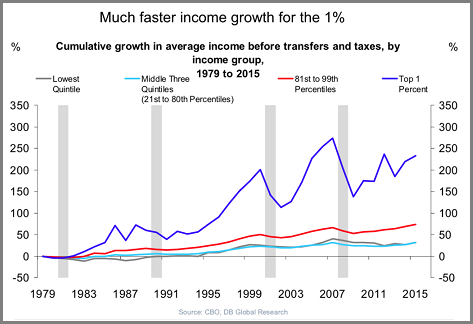 In the same period, the bottom 99% only saw wage growth of just over 17%." 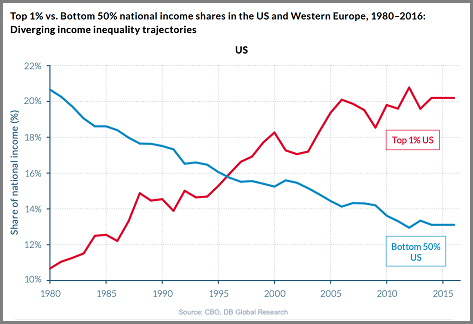 Wealth and income inequality is perhaps the greatest economic, political and moral issue of our time. We must never stop fighting until we have an economy that works for ALL, not just the 1%. Once again here is yet another chart that leaves us with the question of "What must be done? ", and the answer being provided in terms of "fighting" doesn't tell us what we must do to actually bring about corrective change except to remain in the same position spinning our wheels. We don't want some mental fantasy about imagining we are making a difference by continuing to play out some spectator role in a political system with a rigged voting system under the auspices of a Constitution which permits an idiot like Trump to remain, must less get into office in the first place and permit like-minded idiots take charge. Using charts and diagrams is a fool's errand if you think this will get things done. All this does is perpetuate the same stupid governing system and performs like a pacifier until another election comes around. Providing charts and diagrams as a means for a collective mindset of the public to share in the same head shaking session until the next voting session does not provide us with a means to make a difference to effect a change the here and now instead of the sometime-in-the-future moment. This is little more than playing a game of wishful thinking. We can have little faith in this rationale. What do we do when the means and methods of legal protest for progressive change must be accomplished within guidelines the reigning Neanderthals have voted into law as being acceptable... acceptable because they can control it into being a negligible activity? What must be done if we are confronted by a ruling State of Homo neanderthalensis that control the Military and pseudo-military police forces? Who do we turn to for assistance when so many are fearful of retribution and retaliation in one form or another? Is the only (lower case) imperative to force an (upper case) IMPERATIVE in line with a progressiveness that the mentality of a Neanderthal with its "buck" hunting predatory focus, does not have the capacity to fully comprehend, much less put to use even if it is spelled out by holding their hands? How do we teach more complex ideas to those still grappling with their image seen in a mirror, like so many monkeys do upon acquiring the realization of their own reflection for the first time? Those with an evolved and/or evolving consciousness can not live well amongst the brutish idealisms of Neanderthals. And because there is no where to retreat to, we must either make a stand or succumb to various forms of self-denial, self-recrimination and self-abuse... because there are too few to say Enough, is Enough, is Enough! Capitalism in the hands of those with a Neanderthal mentality will always spell misfortune for the majority. Capitalism in and of itself is not the problem, for it is but a tool that is presently being misused in the hands of those in dominant social positions. Such a mentality is selectively tribal (Nationalistic), and thus isolationist, whereby it seeks to preserve the antiquated ethos that the Many must serve the few who arrogantly define themselves with labels, terms and definitions exhibiting a representative exaltation meant to be interpreted as a "chosen one" (selectively favored, privileged, or entitled)... no matter if another must suffer or destruction occurs in order to reaffirm to themselves and their own that they are a preeminent priority all others must defer to in any and all circumstances they wish to interpret as part of their domain. 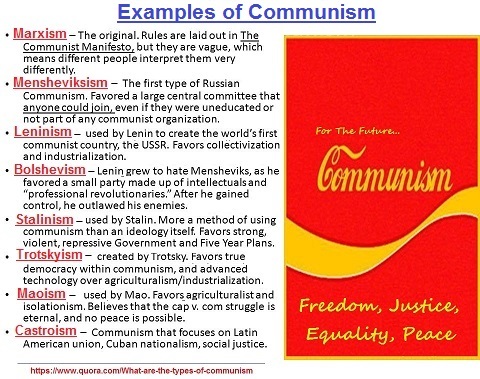 In as much as the adherents of Communism, Marxism, and Leninism, (as well as Anarchy, Libertarianism, Socialism, etc...) all feel that their views represent forward-thinking ideas with far-reaching→ progressive and evolutionary idealism, the way their ideas are being presented... along with past uses of poorly executed formulas thereof, leave a bad taste in the minds of the larger public who feel such ideas are impractical and thus untenable. They think that democracy is best, even though none of us have actually lived in a social environment in which a full measure of democracy is practiced. The closest variation of an Actual Democracy is found in Sweden, with its practice of Direct Democracy. All other so-called democracies are illusory variants. What is to be done when a large segment of a given population is confronted by a situation in which a village of Neanderthal idiots hold the social high ground of most Institutions (business, government, religion), and thus regulate the laws of social expectation out of which is perpetuated a social structure that is interpreted to be counter-productive by those whose ideological permutations present us with a situation in which there is a growing segment of people who represent a developmental progression from the Neanderthal world-view? What is to be done when the dominant establishments of a given society enforce a way of life to ensure the continuance of an out-date Neanderthal or Australopithecine world-view, which is counter-productive to the vision of a growing consciousness, even though it is often falsely adopted by different sects of interest wanting to promote their ideas an expression of progressiveness? What is to be done when we are confronted by a group who persist in regurgitating ideas and activities which persist in maintaining a way of life that many of us have long grown out of, and aspire to a future setting in which there is no cyclicity of dichotomies like war versus peace, Heaven versus Hell, disease and injury versus a system of health care that is wholly insufficient and inadequate, but satisfies a Neanderthal conception of Capitalism instead of a formula of Capitalism which provides for International standards of universal Health Care? What is to be done when institutions not only permit, but insist that the dominant positions or effects of dominant positions be under the control of those whose vision is as aged and worn out as themselves, thus describing for the need to establish global mandates regarding term limits in all occupations. What is to be done when we live in a society that may well establish minimum wage levels but can not imagine the establishment of maximum wage, salary and profit levels? What is to be done when we have the capacity to provide universal education standards for everyone, including higher education that should be free in order to assert the prerogative that humanity desires to progress as far as is humanly possible, only to be confronted by a Neanderthal mentality in charge of defining when, where, how and for what reason(s) the tool of Capitalism is to be used? What is to be done when there exists Military/Industrial complexes the world over whose day to day philosophies are expressed in efforts to ensure the need for establishing a primacy of need so that a sense of job security can be maintained, regardless of to what lengths of war or conflict-mongering instigation must be used? What is to be done When the public acknowledges that many of its legisltators and other government officials who are enabled to make in-department policies do so knowing that such leaders can not be directed to do other-wise on behalf of the public, and the only option is to confront them head-on? What is to be done when there exists a ridiculous custom that Peace can only be defined by an absence of War, yet not an absence of poverty, hunger, homelessness, ignorance, lack of healthcare and other valuations of life that should be right be deemed as basic, inalienable rights? What is to be done when there exists a public education system whose curriculums can not affect needed changes in homes, neighborhoods, towns, cities, states, and countries, in order to keep the multiple forms of educated ignorance from infecting the world with a disease the Centers for Disease Control are themselves infected with in terms of a disabling social virus which creates a mindset of rationalization to adopt the standards of a Neanderthal government mentality in order to maintain its funding, whereby it can not recognize its own debilities? What is to be done with a nation of scientists and researchers whose energies are efforts that refuse to look too closely at the institutions which provide funding, whereby all of them perpetuate an unrecognized standard of practice which can not see clearly beyond the veil of mandated Neanderthal interests? What is to be done when there exist so many inequalities and absurdities in present social systems we are confronted with but insist on maintaining, because we lack the courage to question traditions and implement retroactive refinements desperately needed in business, government and religion? What is to be done when we are confronted by multiple systems of conventionalized and alternative religion and other social practices that are little more than updated variations of antiquated Neanderthal and earlier themes of solar worship, lunar worship, star worship, fertility worship, tree worship, animal worship, etc...? What is to be done to alter the course of humanity so that it may better benefit from its abilities, if the language being used is recognized as being similar, but can not be appropriately interpreted as it is being used in a progressive manner? What is to be done with the many social media sites which display a high intelligence among a few, rudimentary intelligence among many, but most often describes a majority of utter ignorance in terms of self-obsession akin to a personalized level of isolationism which seeks acknowledgement of personal worth by various indications of being liked by strangers or a few chosen friends, family and relatives? What is to be done with a society of people who acquire competency in one or more jobs skills in a given time and place, and use this as the primary means of defining self-worth, but would deem themselves worthless if they were to find themselves in a situation that they had difficulty establishing some level of required competency for a selected task that others in the same situation are mentally and physically configured ideally to? What is to be done with a government that many recognized as in need of replacement, but what they would offer is but a variation of the same values with different labels under the leadership of different people who are themselves variations of the Neanderthal mentality? What is to be done when the functionality of society basis itself on a celebration of mediocrity, instead of an actual degree of progressive creativity and originality of thought put into action? 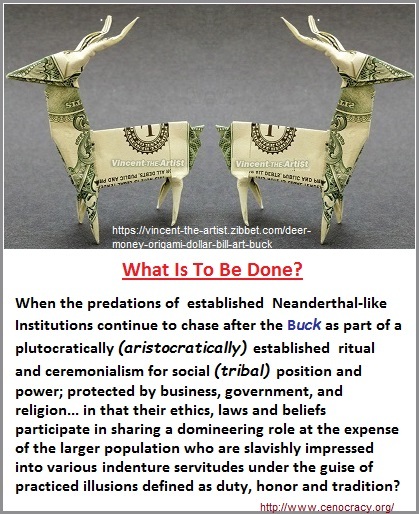 What is to be done when it is recognized that we need a New Government (a Cenocracy), yet there is a wide-spread insistence on advocating but another variation of a Neanderthal applied Capitalism with the garments and enough embellishments to conceal the similarity? What is to be done with those who claim their views are representative of a Natural fundamentalism, yet fail to recognize their own Neanderthal-linked valuations, defended by further claiming that we are all alike and must therefore accept the variations because in their view, nothing better exists... and may not exist for millions of years... thus insisting on perpetuating the old system with them in charge in order to be privy to entitlements? What is to be done when we are done talking about it and seek some means of pushing forth progressiveness, even if it means aggressive assertiveness... only to be used as an excuse by reigning authority to vindicate one or another Neanderthal interests in order to use whatever force is necessary to push back and promote the acceptance and maintenance of a status quo which leaves them in charge at the expense of the majority? What is to be done when there exists a public that agrees with the IMPERATIVE, but is yet too timid to form a line of resistance as well as participate in a Vanguard? What is to be done when it is acknowledged that many of those who are encountered in social media sites are not necessarily those who are familiar with geting involved in tasks requiring one to roll up their sleeves, but are instead arm-chair participants in most of the tasks they have done throughout their lives? What is to be done when one is confronted by the reality that most people have lived a life of silent reservation, though they may hold strong alternative views which are rarely or never shared, because in so doing one thinks they are thus committed to some formal action that will impact one or more lives negatively? What is to be done when there are several who agreed with your views on one or another social media site or when speaking to them in person but little more than an agreement, a consensus on one or another issue is accepted... but you are left with the impasse you began with? What is to be done with segment of the population that feels that violence is not the answer, while living under the threat of violence presented to them in various guises such as warranty limits used by businesses, legalized political standards involving multiple security agencies (including the miliary) which have a stockpile of readily available armaments, and beliefs used by religions which force compliance by way of an indoctrination begun in childhood... all of whom have their own methods and manners for extricating money from the public, such as paying for extended warranties, taxation, and tithing? What is to be done when many people are afraid to openly assess the current systems of society the world over and ask what is to be done to correct so many needless mistakes that occur cyclically, as if they too were a circadian rhythm established by the nature of the planet instead of the nature imposed on them by Neanderthal-linked living standards? What is to be done with the consciousness of a person, for whatever reason, finds themselves awakening beyond the accepted or adopted standards of a socialized Neanderthal mentality and can no longer justify living as they do amongst those they have done so? Where are they to go when there are no easily discernible sanctuaries except among those who practice their own Neanderthal orientations of mindlessness under the concealment of different attire, words, locations, attitudes and conventions within given environments? What is to be done when one comes to realize that their once cherished institution, belief, or life-style is but another crude Neanderthalism preventing their full development, by excusing integrated obstacles as cermonialized levels, steps, degrees or other fabricated positions of potential achievement? What is to be done if we discover are physics, mathematics, sciences, arts, music and humanities are merely road-side, graveyard, and battle-ground crosses, teddy-bears, flowers, vases, headstones, and epitaph configurations being used by a social order finding different ways of towing-the-line of an established Neanderthal grave-site menatality that has been kept alive by an unrecognized practice of paying tribute to those that our Cro-Magnon forbearers came to extinguish in what can be termed the Neanderthal's last stand? Is current human society that designed by both denial and guilt for having exterminated those ancient forms of modern humanity came to realize were functionally less cognitively endowed, and need not be totally exterminated, but left to live out their lives... unlike the Neanderthal societies of today which are presenting us with little option but to exterminate them because they are like children with loaded guns and an unlimited supply of ammunition? Are our present ideas forms of remembrance that can be individually altered to some degree, instead of setting in stone some image that does not permit multiple variations in order to conceal a given past? What is to be done when one acknowledges that labels advancing the existence of something more, something there, something as yet inexplicable; are often the transitional states of a Neanderthal mentality which can not exceed the precipice of an inherent biological design, yet those advocating such labels are wholly oblivious of their condition or what such a realization means in terms of need to develop further? 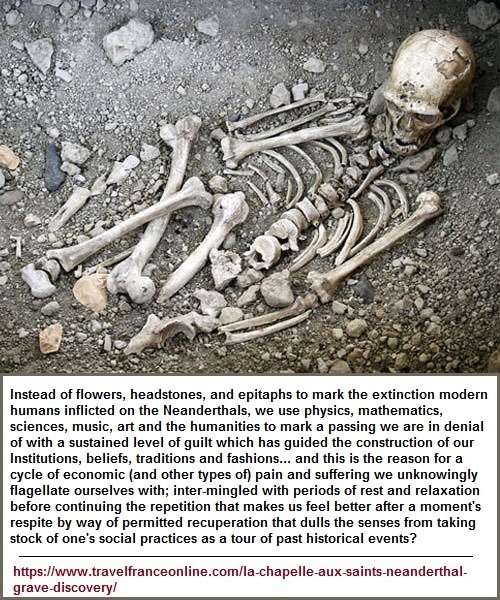 What is to be done with those advocating Transhumanism, but are unable to recognize their particular ideology as a minor appreciation of a miniscule transitional Neanderthal stage of mentality grappling with a functionality of brain activity representing an evolutionary development of consciousness... like the difference between the consciousness of a monkey to that of a post Neanderthal Cro-Magnon individual? What is to be done first, when there is so very much to do, so that we do not trip over ourselves and create complications that have a reverse instead of a progressive effect? What is to be done if we seek to conclude that most of humanity today is closer to the Neanderthal than an assumed Cro-Magnon predecessor?